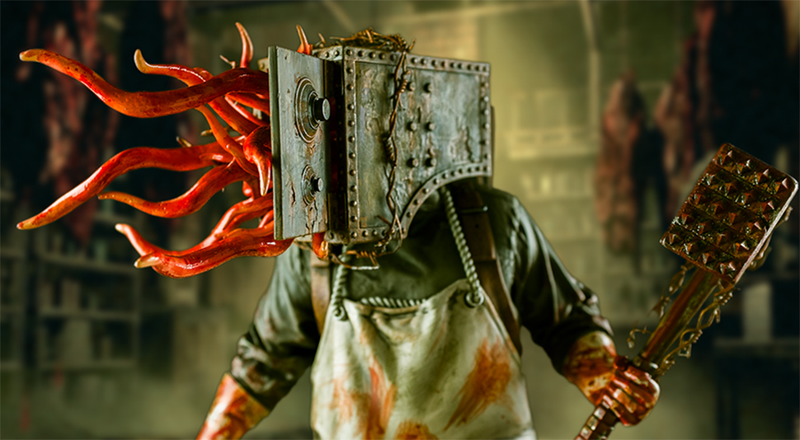 I can understand a Skyrim statue, and those Doom plushies were about the cutest thing ever, but the latest fruit of Bethesda's partnership with collectible maker Gaming Heads is a $300 statue of a man with a barbwire-wrapped safe spouting tentacles for a head. That's not okay. Now I have not played The Evil Within yet. I have downloaded the game to my computer. There it sits, taunting me. I'm a bit scared, and this statue is not helping at all. The Keeper here has got a very Silent Hill/Clock Tower sort of vibe about him, which is not helping his case. There's something about a faceless evil that just shakes me to the core. I guess I figure I can reason with someone who can smile. When their smile is the door to their face opening and tentacles waggling, not so much. The regular edition is set at 750 pieces and only runs $269, but look at that face. Never trust a meat tenderizer-wielding maniac with a closed head-safe. He's obviously hiding something. I guess I'm going to have to play the game. I hear The Keeper is going to be the protagonist in some downloadable content. Maybe I'll learn to love him there.